The CRM Marketing module allows you to send email campaigns to your Contacts. You’ll need to add your Contacts, as Members, to a Campaign Stage. The 14 day trial of our CRM includes the Marketing module. However, the trial is limited to sending a maximum of 10 emails per Campaign Stage. If you need to mail a larger number to successfully trial the system please contact our Customer Support team. The CRM Mailer (the email sending system built into your CRM) will check your system for emails in the Mail Queue every few minutes. Emails are put into the Mail Queue by the Email Scheduler, which can specify if all the emails should be sent as soon as possible, sent at a date and time in the future, or spread out over a date and time range. The Mailer will then send your emails in the order specified. You can run multiple mailings at the same time, all with different emails and send times. You can check the progress of your mailings in Send Emails/ Monitor Emails. You can add emails to the Mail Queue in two ways. 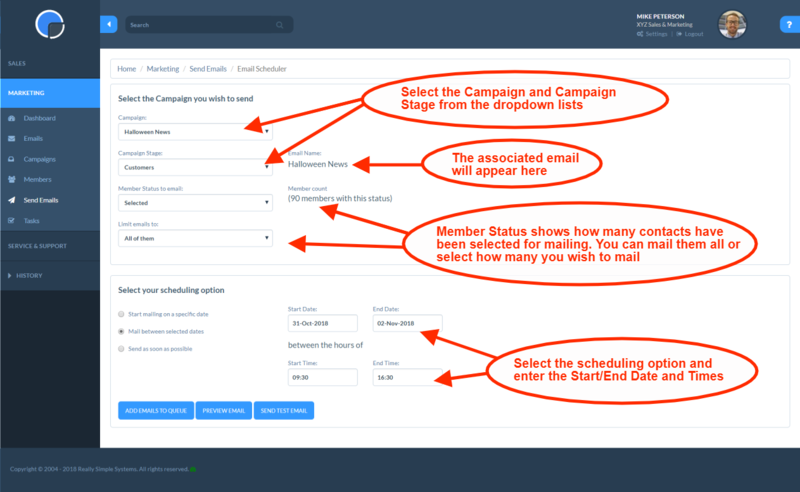 You can use the Email Scheduler or you a can add Contacts manually to a campaign that’s already running. 4) In the ‘Member Status to Email’ select the Status of the Members you wish this email to go to. If this is your first email to the selected Members the status will be ‘Selected’ but on future emails in the same campaign you might, for example, only want to send to those who ‘Clicked through’ on the links in your last email, e.g. those interested in your message. 7) You can send yourself a Test Email to see exactly what your contact will receive. Dribble out emails between (recommended) – send the emails in small batches evenly between the dates and times you specify. If you have more than 1,000 emails to send we recommend you use this option as your emails will run less risk of being classed as Spam. Your maximum quota for sending emails will be 1,500 per hour, but if you have a low Sender Reputation or are a new customer it will be lower. Email them starting – send the emails as quickly as possible, starting from the date and time you specify. Send as soon as possible – send the emails as soon as possible. Only use this option when sending a small number of emails. Once you hav scheduled your emails you can check their progress using the Monitor Email Queue feature. In the Mailer Queue Monitor you can pause the Mail Queue page by clicking the red ‘Pause Mailer Queue’ button. If you pause the Mailer then no further emails will be sent until you start the Mailer again. In the Campaign Stage you can change a Member’s Status to ‘Queued’ which will schedule an email to be sent to that Member as soon as possible. This is useful where you might want to resend an email or add a new group of Contacts to the Campaign. This dropdown list can be changed to suit your business needs in Custom Dropdown Lists, on the CampaignActivity table. Once the emails are in the queue the Mailer will start sending them out. You can also add Contacts to a Campaign, or send an Email to a Contact directly from the Contact record grid. Click the checkbox next to their name in the Contacts grid, then click on the ‘More’ button. Select the option you want, i.e. Add to Campaign or Send Email, and select the Campaign or Email required using the search box. Click the blue action box to complete the procedure. The speed that the Mailer sends out your emails will depend upon your Sender Reputation. If you have a good Sender Reputation it will send up to 1,500 per hour. If you are just starting email campaigns it will start at 250 per hour until your Sender Reputation is calculated. The actual time that an email is sent will depend upon how many emails you have queued and your Sender Reputation. You can monitor your Mailer Queue by going to Send Emails, then Monitor Emails. Before attempting to deliver an email the system checks that there is an email address, that the email address is valid and finally if the email address’ domain exists. Emails that fail are flagged as ‘Invalid Email’. If we can’t contact a mailserver at the domain it is being sent to it will be flagged as ‘Unresolved’. Successful emails are flagged as ‘Mailed’. See Email Member Status for further details. The Mailer automatically manages your email campaign, updating your database in response to email Bounces, Unsubscribes and Spam complaints. Find out more Email Member Status. Can I see what an email looks like before I send it? Yes, the HTML Editor gives you a live preview while you build your Email or you can use the “Email Preview” button on the Email Scheduler. Best, however, is to send some test emails to yourself to check what it looks like in your email client – use the “Send Test Email” button on the Email Scheduler. The Mailer sends most of the emails in a Campaign Stage, but some are left over, why is this? Check that those Contacts are not on Hold. The Mailer does not send any emails at all, why is this? Check that the Campaign is “Active” and that there is an Email defined against the Campaign Stage. The Email also needs to be Active. The Monitor Emails page should indicate if any of the above problems exist. Monitor Emails is still showing emails as being queued for today, even though I specified them to be sent by this time, why is this? If you have specified a large number of emails to be sent, or a small time window, the Mailer may not have had enough time to deliver them. The Mailer will attempt to catch up by sending them after the time you have specified. How do I stop emails being sent? How can I reschedule emails in the queue? “Queued” for the Status and the new times and they will queued for those new times. What happens if I change an Email half way though sending emails? The Mailer finds and personalises your Email each time it sends a batch out. If you change an Email half way though a mail shot, subsequent emails will reflect those changes.